Anne Frank was born into a Jewish family in Frankfurt-am-Main, Germany, on 12th June, 1929. When Adolf Hitler came to power in 1933, Otto Frank, his wife and two children, Anne and Margot moved to Amsterdam. When the German Army occupied the Netherlands, the family went into hiding. For the next twenty-five months they lived in a sealed-off office back-room. Anne Frank's decided to keep a diary. Her first entry on 8th July, 1942, recorded her feelings about going into hiding: "Into hiding - where would we go, in a town or to the country, in a house or a cottage? These were questions I was not allowed to ask, but I couldn't get them out of my mind. Margot and I began to pack some of our most vital belongings into a school satchel. The first thing I put in was this diary, then hair curlers, handkerchiefs, school books, a comb, old letters; I put in the craziest things with the idea that we were going into hiding. But I'm not sorry, memories mean more to me than dresses." Three days later Anne Frank wrote: "I can't tell you how oppressive it is never to be able to go outdoors, also I'm scared to death that we shall be discovered and shot. That is not exactly a pleasant prospect. We have to whisper and tread lightly during the day, otherwise the people in the warehouse might hear us." Soon after going into hiding the Gestapo began looking for Jews. "Dussel has told us a lot about the outside world, which we have missed for so long now. He had very sad news. Countless friends and acquaintances have gone to a terrible fate. Evening after evening the green and grey lorries trundle past. The Germans ring at every door to enquire if there are any Jews living in the house. If there are, then the whole family has to go at once. If they don't find any, they go on to the next house. No one has a chance of evading them unless one goes into hiding. Often they go round with lists, and only ring when they can get a good haul.... In the evenings, when it's dark, I often see rows of good, innocent people accompanied by crying children, walking on and on, bullied and knocked about until they almost drop. No one is spared - old people, babies, expectant mothers, the sick - each and all join in the march of death." Anne Frank's hiding place in Amsterdam. On the 11th April 1944 Anne Frank wrote: "Who has inflicted this upon us? Who has made us Jews different to all other people? Who has allowed us to suffer so terribly up till now? It is God that has made us as we are, but it will be God too, who will raise us up again. If we bear all this suffering and if there are still Jews left, when it is over, then Jews, instead of being doomed, will then be held up as an example. Who knows, it might even be our religion from which the world and all peoples learn good, and for that reason and that reason only do we have to suffer now." 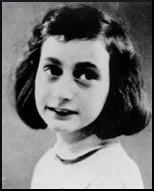 Anne Frank became very excited when she heard about D-Day on the BBC news on 6th June, 1944: "The invasion has begun! According to the German news, British parachute troops have landed on the French coast. British landing craft are in battle with the German Navy, says the BBC. Great commotion in the Secret Annexe! Would the long-awaited liberation that has been talked of so much but which still seems too wonderful, too much like a fairy-tale, ever come true? Could we be granted victory this year, 1944? We don't know yet, but hope is revived within us; it gives us fresh courage, and makes us strong again." On 21st July, 1944, Anne Frank heard the news about the July Plot and the death of Claus von Stauffenberg. "I'm finally getting optimistic. Now, at last, things are going well! They really are! Great News! An assassination attempt has been made on Hitler's life, and for once not by Jewish Communists or British capitalists, but by a German general who's not only a count, but young as well. The Fuhrer owes his life to 'Divine Providence': he escaped, unfortunately, with only a few minor burns and scratches. A number of officers and Generals who were nearby were killed or wounded. The head of the conspiracy has been shot. This is the best proof we've had so far that many officers and generals are fed up with the war and would like to see Hitler sink into a bottomless pit, so they can establish a military dictatorship, make peace with the Allies, rearm themselves and, after a few decades, start a new war. Perhaps Providence is deliberately biding its time getting rid of Hitler, since it's much easier, and cheaper, for the Allies to let the impeccable Germans kill each other off. It's less work for the Russians and British, and it allows them to start rebuilding their own cities that much sooner. But we haven't reached that point yet, and I'd hate to anticipate the glorious event." In August, 1944, the family were betrayed to the Gestapo and they were arrested and deported to German occupied Poland. After spending a month in the extermination camp in Auschwitz, Anne and Margot were sent to Belsen, a concentration camp in Germany. Anne Frank and her sister both died of typhus in March, 1945. Otto Frank, the only member of the family to survive, was rescued from Auschwitz by Red Army troops in January, 1945. After he arrived back in Amsterdam friends gave him the papers that the Gestapo had left behind after searching the hiding place. This included Anne Frank's diary that was published in the Netherlands in 1947. It has since been published into 67 languages and is one of the most widely read books in the world. Into hiding - where would we go, in a town or to the country, in a house or a cottage? These were questions I was not allowed to ask, but I couldn't get them out of my mind. Margot and I began to pack some of our most vital belongings into a school satchel. The first thing I put in was this diary, then hair curlers, handkerchiefs, school books, a comb, old letters; I put in the craziest things with the idea that we were going into hiding. But I'm not sorry, memories mean more to me than dresses. I can't tell you how oppressive it is never to be able to go outdoors, also I'm scared to death that we shall be discovered and shot. That is not exactly a pleasant prospect. We have to whisper and tread lightly during the day, otherwise the people in the warehouse might hear us. Dussel has told us a lot about the outside world, which we have missed for so long now. He had very sad news. Countless friends and acquaintances have gone to a terrible fate. Evening after evening the green and grey lorries trundle past. The Germans ring at every door to enquire if there are any Jews living in the house. If there are, then the whole family has to go at once. If they don't find any, they go on to the next house. No one has a chance of evading them unless one goes into hiding. Often they go round with lists, and only ring when they can get a good haul. In the evenings, when it's dark, I often see rows of good, innocent people accompanied by crying children, walking on and on, bullied and knocked about until they almost drop. No one is spared - old people, babies, expectant mothers, the sick - each and all join in the march of death. Our many Jewish friends are being taken away by the dozen. These people are being treated by the Gestapo without a shred of decency, being loaded into cattle trucks and sent to Westerbork. Who has inflicted this upon us? Who has made us Jews different to all other people? Who has allowed us to suffer so terribly up till now? It is God that has made us as we are, but it will be God too, who will raise us up again. If we bear all this suffering and if there are still Jews left, when it is over, then Jews, instead of being doomed, will then be held up as an example. Who knows, it might even be our religion from which the world and all peoples learn good, and for that reason and that reason only do we have to suffer now. "This is D-day", came the announcement over the British radio. The invasion has begun! According to the German news, British parachute troops have landed on the French coast. British landing craft are in battle with the German Navy, says the BBC. Great commotion in the 'Secret Annexe'! Would the long-awaited liberation that has been talked of so much but which still seems too wonderful, too much like a fairy-tale, ever come true? Could we be granted victory this year, 1944? We don't know yet, but hope is revived within us; it gives us fresh courage, and makes us strong again. I'm finally getting optimistic. Now, at last, things are going well! They really are! Great News! An assassination attempt has been made on Hitler's life, and for once not by Jewish Communists or British capitalists, but by a German general who's not only a count, but young as well. The Fuhrer owes his life to 'Divine Providence': he escaped, unfortunately, with only a few minor burns and scratches. A number of officers and Generals who were nearby were killed or wounded. The head of the conspiracy has been shot. This is the best proof we've had so far that many officers and generals are fed up with the war and would like to see Hitler sink into a bottomless pit, so they can establish a military dictatorship, make peace with the Allies, rearm themselves and, after a few decades, start a new war. Perhaps Providence is deliberately biding its time getting rid of Hitler, since it's much easier, and cheaper, for the Allies to let the impeccable Germans kill each other off. It's less work for the Russians and British, and it allows them to start rebuilding their own cities that much sooner. But we haven't reached that point yet, and I'd hate to anticipate the glorious event.